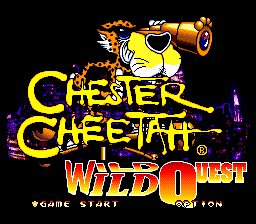 Chester Cheetah: Wild Wild Quest is the sequel to Chester Cheetah: Too Cool to Fool. It was released for the Sega Mega Drive exclusively in North America in 1994. This one plays more like a traditional platformer than the previous game, and offers less "cartoony" graphics. Main article: Chester Cheetah: Wild Wild Quest/Magazine articles.